From year to year, the number and strength of storms that develop during the Atlantic hurricane season varies. This year, despite the pre-season arrival of Tropical Storm Ana, NOAA is forecasting a 70% chance of a below average season. Tropical cyclones, known as hurricanes in the United States, develop around the globe at different times of the year. In this country, we are most affected by the Atlantic hurricane season, which impacts the North Atlantic Ocean, Caribbean Sea and Gulf of Mexico. It runs from June 1 through November 30. While the overall number of storms expected to develop this year is low, it is important to remember that it only takes one land-falling system to cause serious damage. Relentless rain unleashed catastrophic floods across southeast Texas this past weekend. Coming out of a prolonged drought, officials say this was the worst flooding the region has seen in years. 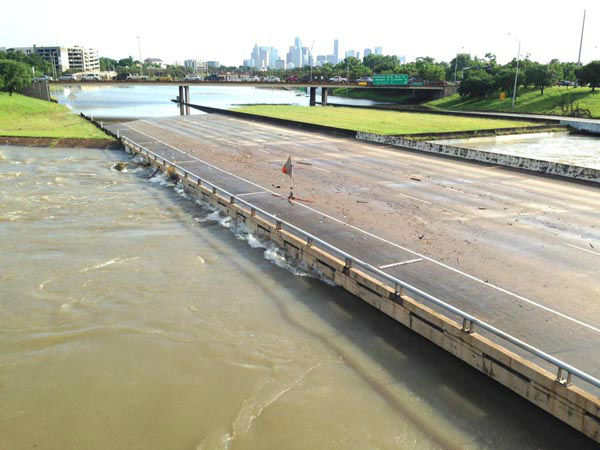 In Houston, more than 10 inches of rain fell Monday night into Tuesday morning. With the ground already saturated from plentiful spring rains, rivers and bayous swelled out of their banks. The floodwaters inundated homes, businesses, and major roadways, paralyzing large parts of this country’s 4th largest city. Rainfall rates reached as high as 4 inches per hour, which prompted the NWS to issue a flash flood emergency – the highest level of flood alert – for the area. Local officials say 3 people were killed and more than 80,000 people lost power as a result of the flood. On Sunday, torrential rain in Hays County, TX caused the Blanco River to rise more than 30 feet in 3 hours. Before the river gauge was washed away, it reported a crest of 40.21 feet, which is about 7 feet above the previous record set in 1929. Officials there say the raging water destroyed more than 350 homes and that 13 people are still missing. Just north of Texas, the Oklahoma City area also experienced severe weather and flooding this holiday weekend. Across both states, floodwaters caused a number of fatalities. The combined death toll currently stands at 14, but is expected to rise. The intensity of these rain events had two main drivers. First, a mass of warm and deeply saturated air moved north from the Gulf of Mexico. It then ran into a deep dip in the jet stream, which has been locked in place over the western states recently. This collision triggered intense thunderstorms that wrung tremendous amounts of moisture out of the air. The result was a series of deadly and destructive deluges across the region. The Governor of Texas, Greg Abbot, has declared 37 counties from the Red River to the Rio Grande to be disaster areas as a result of recent weather events. More rain, unfortunately, is forecast for the region this week. The sky puts on an amazing light show everyday. 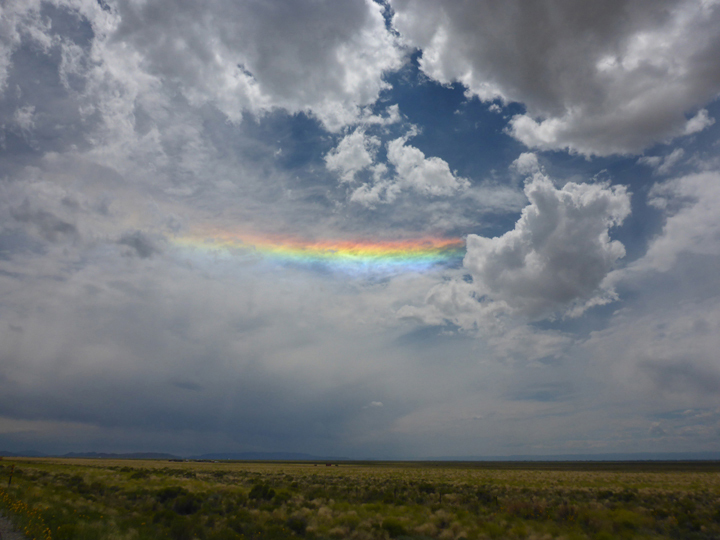 But sometimes, it produces something special like a circumhorizontal arc. Often mistaken for a rainbow, a circumhorizontal arc is an entirely different optical phenomenon. It is formed by the refraction, or bending, of sunlight through plate-like hexagonal ice crystals that are situated horizontally in cirrus or cirrostratus clouds. More specifically, light enters through the vertical side of the crystals and exits through their horizontal bottoms.This angled pathway produces the well-separated colors of the spectrum that we see in the sky. They are brightest where the cirrus clouds are thickest. Oriented parallel to the horizon, a circumhorizontal arc always sits below the sun. Rainbows, by contrast, are produced by the combination of refraction and reflection of sunlight in liquid water droplets. These arching bands of color always appear in the part of the sky that is opposite the sun. Circumhorizontal arcs are somewhat rare. In addition to the appropriate cloud conditions, they require the sun to be very high in the sky – at least 58° above the horizon. They are usually only seen during the summer in the mid-latitudes. Drought has plagued the western and southwestern regions of the US for years, with the highly populous states of Texas and California being particularly hard hit. In recent weeks, however, plentiful spring rain has brought the Lone Star state some much needed, if not complete, relief. According to the latest report from the US Drought Monitor, exceptional drought, the worst possible category is no longer present in Texas. This is the first time this has happened since July 2012. While this is good news, other categories of drought still persist across 36% of the massive state. The intense rain has also caused flooding. California, in its fourth year of drought, also received some much-needed rainfall recently. On Thursday, San Diego received 1.63 inches of rain making it their wettest May since 1921. This impressive daily total was not only unusual as the region is now in its “dry season”, but was also more than that city typically gets all summer. Despite this recent rain in the southern part of the state, 98% of California remains in some form of drought with nearly 50% in exceptional drought. 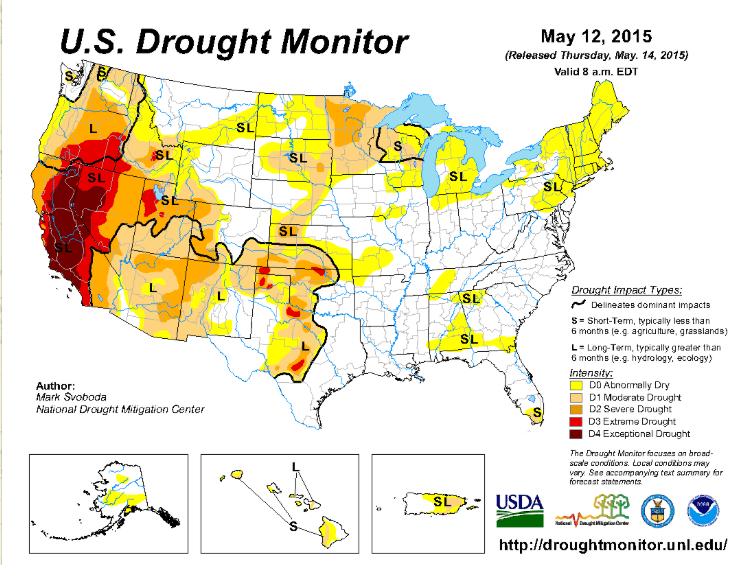 The Drought Monitor is a weekly publication produced by a partnership of government agencies, including the National Drought Mitigation Center, the United States Department of Agriculture, and the National Oceanic and Atmospheric Administration. The official start of summer is more than a month away, but temperatures have been soaring in New York City! A large ridge in the jet stream has ushered unseasonably warm air into the region. In fact, eight of the last twelve days have seen temperatures reach well into the 80s. Today, the mercury soared to 86°F in Central Park, making it the warmest day of the year to date. Our normal high for this time of year is 70°F. While the pre-season warmth can be easy to acclimate to, especially after a cold and snowy winter, these summer-like conditions are not expected to last much longer. A cold front is forecast to move through the region late tonight sending temperatures back to more seasonable levels. 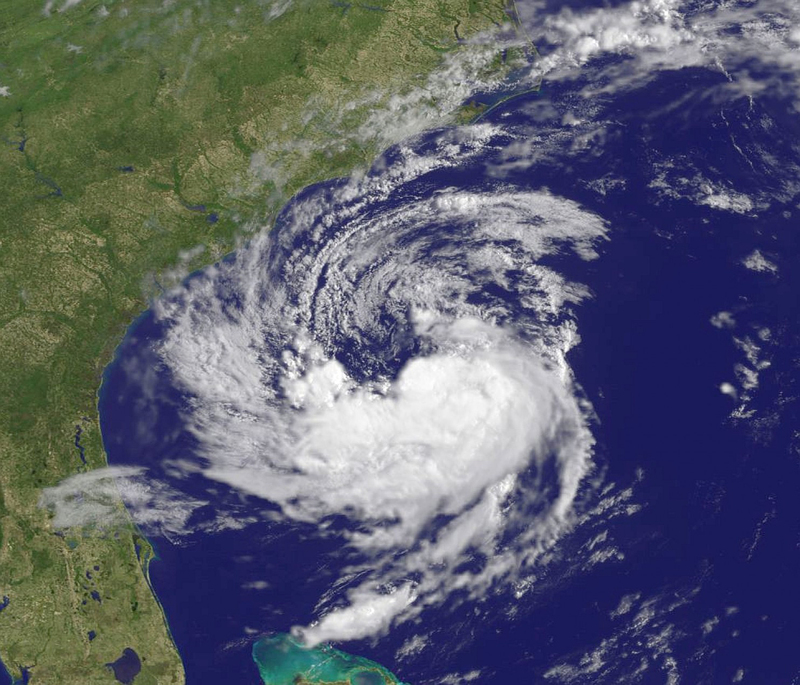 Subtropical storm Ana, the first named storm of the 2015 Atlantic Hurricane Season has officially formed. With winds measured at 45mph earlier today, the center of this pre-season storm is located about 180 miles southeast of Myrtle Beach, SC. According to the National Hurricane Center (NHC), Ana is expected to bring heavy rain and gusty winds to parts of both North and South Carolina over the next few days. It will also produce rough surf and dangerous rip currents along the coast. A subtropical storm is a hybrid of a regular storm, fueled by the clash of warm and cold air, and a tropical storm, powered by the heat and moisture of warm ocean waters. Ana’s hybrid nature means that it has the potential to transition into a fully tropical system, especially as it sits over the warm waters of the Gulf Stream. This is why the NHC assigned it a name. In May 2012, this type of transition happened with Tropical Storm Beryl, which was the strongest pre-season tropical cyclone to make landfall in the US. While pre-season storms tend to occur every five years of so, Ana is the earliest named storm to form in the Atlantic since April 2003 when a tropical storm also named Ana developed. The Atlantic hurricane season officially begins on June 1. Seasons are a way of dividing up the year based on changes in weather. The traditional four – winter, spring, summer and fall – are familiar to most people. In the subtropical climate of south Florida, however, there are really only two – wet and dry. While traveling there recently, I had the chance to learn more about them. The wet season typically runs from mid-May to November. It produces the vast majority of the region’s average annual rainfall, approximately 60 inches. Temperatures often reach into the 90s and humidity levels are high. With sea-breeze fronts developing along both the Atlantic and Gulf Coasts, thunderstorms can occur almost daily during the summer months. The dry season runs from December to mid-May. Temperatures at that time of year range from the mid-50s to upper-70s and humidity levels are relatively low. On occasion, continental cold fronts dip down into south Florida, bringing near-freezing temperatures to the region. Any rain associated with these frontal systems tends to sweep through the area quickly. Only about 20% of the region’s average annual rain total falls during the winter months. 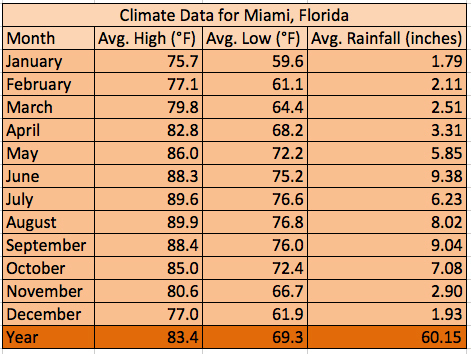 South Florida’s largest rainfall totals are usually associated with tropical storms and hurricanes, which are not uncommon between June and November. 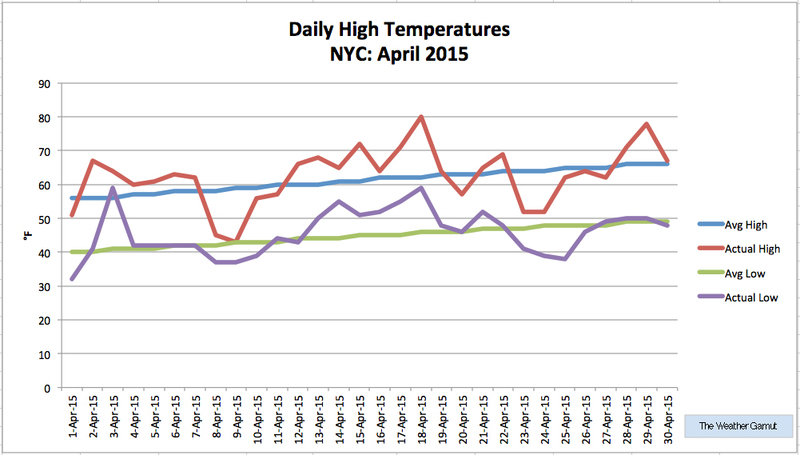 Transitioning to spring, April 2015 felt like a weather rollercoaster in New York City. We had highs that ranged from a chilly 43°F to a balmy 80°F. In the end, though, the warmth won out. The city’s mean temperature for the month was 54.3°F, which is 1.3°F above normal. That makes April the first month since December to produce an above average temperature in the Big Apple. In terms of precipitation, April’s famous showers were scarce this year. The city received a mere 2.08 inches of rain in Central Park. Of this meager total, 1.37 inches fell in a single day. On average, NYC typically gets 4.5 inches of rain during the month of April.